I might take two girlfriends shopping – both of them could try on the same dress and decide to buy it. 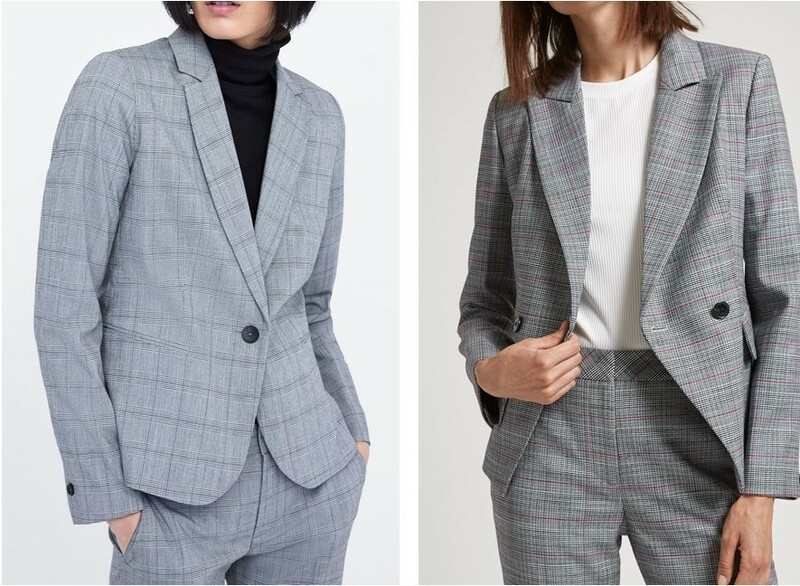 One would wear it to work with a blazer and pumps, in her classic style and the other would wear it casually to meet her friends at a cafe, in a pair of flat sandals and her denim jacket. A simple shirt can be worn many different ways. (Demonstrated beautifully by Carolyn Bessette Kennedy above) As can a pair of chinos or a trench coat. A scrunch here, a fold or a button up there. Even a little tweak, can make an impact. It’s up to you to interpret each piece of clothing from your wardrobe in your own way. What you choose to spend on your wardrobe is entirely up to you. I’ll work within your budget. I work with people who only like to spend $100 on a new pair of jeans and some who wouldn’t blink an eye at spending $350. Despite your budget everyone deserves the right to look and feel great. The above picture is an example of this. The blazer on the left was $69.95, from Zara and the one on the right was $349, from Saba. I will say that I do encourage people to look for quality. Even if the item is not overly expensive still pay attention to what the fabric is and how the garment is made. (It’s not a bargain if it falls apart or looks shabby after two washes and you need to throw it out) I also believe there are some things that are worth spending more on and may require saving for. I was chatting with a friend recently about double denim. She told me she likes it, but every time she tries it it never feels right. She was wondering what she was doing wrong. I thought I’d share with you, what I told her..
Make sure you break up the denim with an interesting shoe, belt, bag, jacket, jewellery, etc. (Even makeup and nail color can do the trick) *If it doesn’t feel sophisticated enough, it could be how you’re accessorising. Also make sure the denim is a modern style. If you’re wearing something that could be outdated it may make you feel you’re stuck in the 80’s or 90’s. . 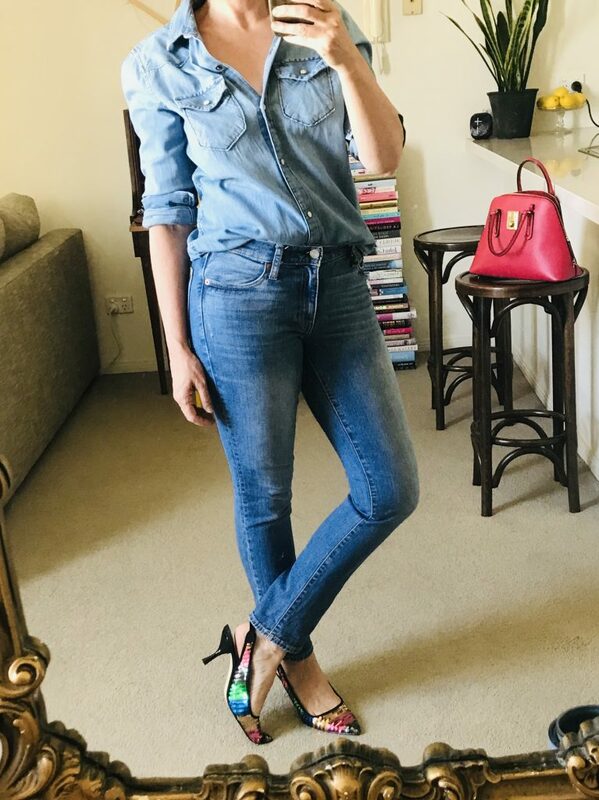 If the denim feels too much, try wearing your jeans, skirt or shorts with something chambray (which will be softer) on top. . I also suggested to her that perhaps she likes the look on other people but it’s just not for her. If it feels uncomfortable when she wears it, it might not be her style. .
Do The Pieces In Your Wardrobe Work Together? 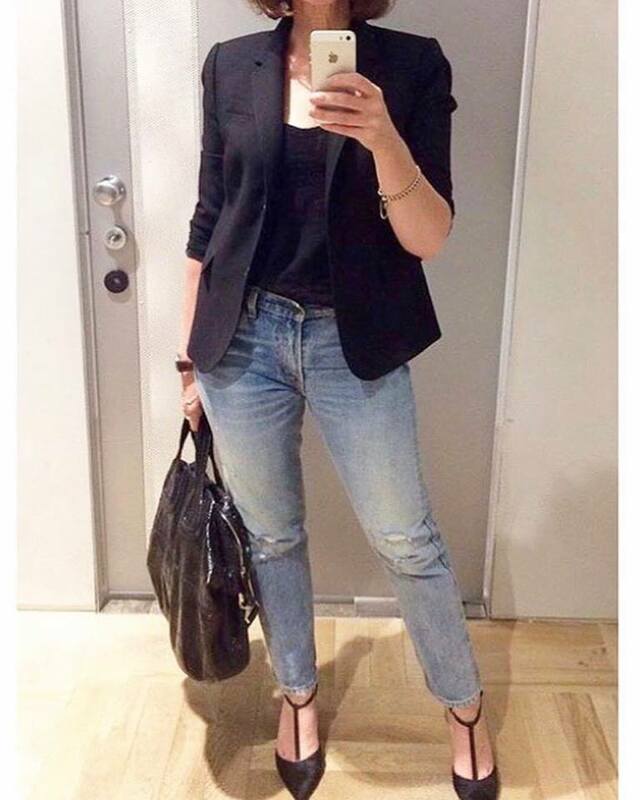 Years ago when I changed careers, I needed to transition my wardrobe from (largely) corporate clothes, to clothes than reflected my new lifestyle. When I set about doing that, the key things for me were to have less pieces, of better quality, but still with plenty of outfit combinations. 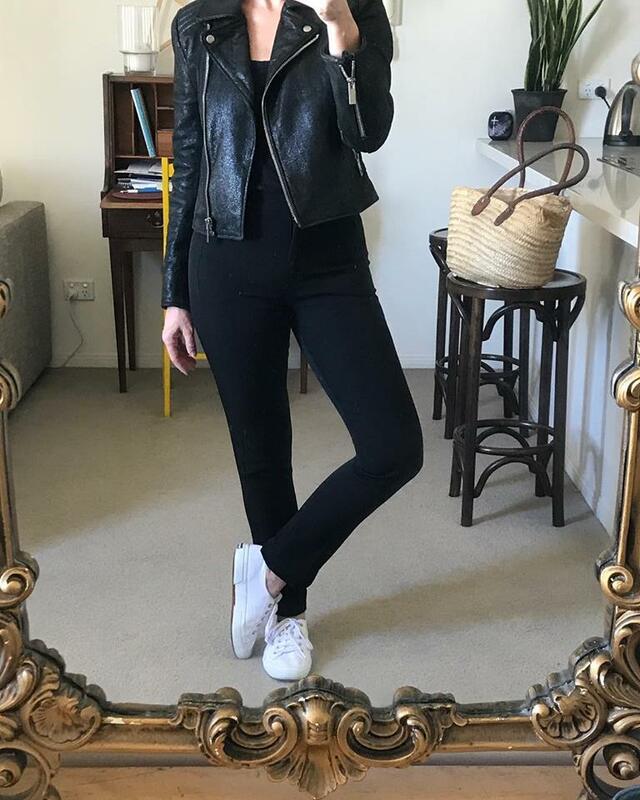 I wanted to simplify my wardrobe and be ruthless with what earned a place in it and when I added anything new, I was strict about making sure it worked with what I already had. If you look at these three photos, you’ll see the pieces all work together. (Same blazer and same black pants throughout.) You’ll also note that the pieces can also be worn in different ways, for different occasions. This is important to me. I want my clothes to be versatile. For example, these black pants could be worn dressed up to a fancy event, if need be, or dressed down, for meeting a friend at a cafe for coffee. In 2019 make conscious additions to your wardrobe. Don’t just buy something because it’s on sale or you saw one of your friends (or someone you follow on Instagram) wearing it. Build a wardrobe of pieces that complement each other. 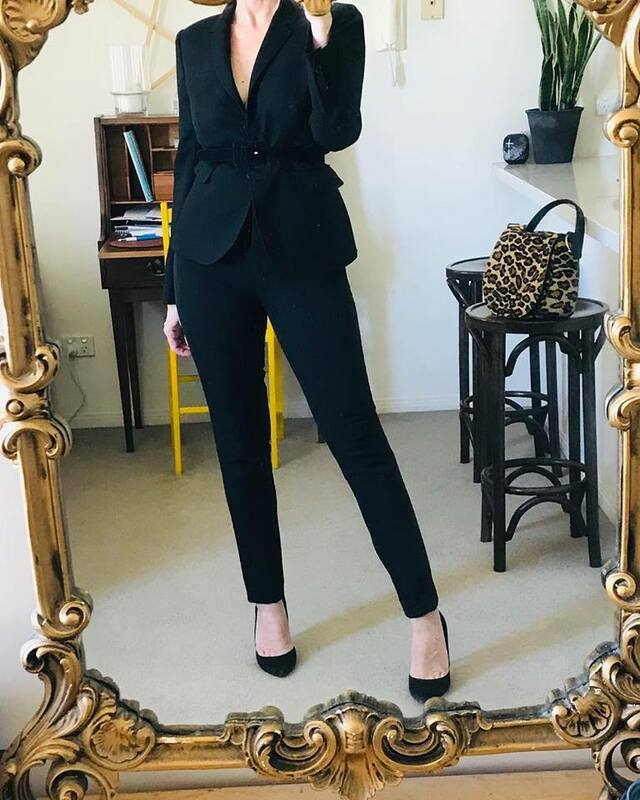 I'm a Personal Stylist from Melbourne who is passionate about helping real women of all ages, shapes and sizes with varying budgets and lifestyles, look and feel the very best they can. I love old things, am addicted to blogs and online shopping sites, have a weakness for happily-ever-after movies and dream of one day having my own apartment in Paris. I'm an avid collector of beautiful books, love a full-bodied glass of red, and could eat my body weight in French cheese. Are Your Clothes Highlighting What You Want Them To? © 2019 MEAGHAN SMITH PERSONAL STYLIST. All Rights Reserved.